Bromo Rafting Pekalen Package 2 Days 1 Night – Vacation Bromo Rafting 2 Days 1 Night or Package Tour Bromo Rafting Pekalen Probolinggo 2 Days 1 Night is a natural tour adventure to Mount Bromo and Pekalen rafting probolinggo at started pick up from Surabaya / Malang then toward the area of Tourism Mount Bromo and proceed with Tour Adventure Rafting river Pekalen in Probolinggo district. Pickup at the juanda airport, hotel or station by our team and will be delivered directly to the village Cemoro lawang, area bromo hotel with a view hotel direcly to Mount Bromo. Upon arriving at the hotel Bromo Check in hotel, free program. Trip To Bromo begins at 3:30 pm with picked up by a driver JEEP from hotel places stay, then headed vantage point on Mount Pananjakan on the edge of the Tengger Caldera to see the beauty of Bromo Sunrise, after finish toward Bromo crater with Jeep, Arriving at the parking area you can ride a horse or walk to reach the crater bromo. Once satisfied, mount bromo tour package continued return to the hotel, shower and preparation for the rafting base camp at Pekalen probolinggo, after arriving at the base camp and then preparation rafting and rafting duration of approximately 3 hours. Finished rafting Pekalen probolinggo then return to base camp,showering body and lunch.Transfer out back to Surabaya and program tour ended. 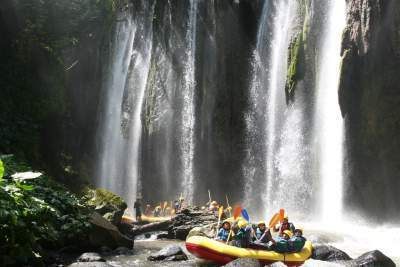 Surabaya Bromo Rafting Package Tour 2 Days 1 Night is a tour program adventure in east java,natural tourism to visiting mount bromo and rafting pekalen river with minimum participants for a groub 4-5 person.